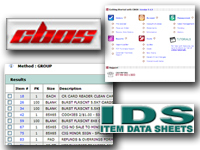 CBOS Online is a web based service that allows chain store accounts to maintain account information and obtain valuable product and movement data. Users can: Manage store retails price book and category changes; Review invoices easily with cost and retail changes highlighted; Build customized invoices; and even place orders. CBOS is a C.D. Hartnett Company product developed exclusively for c-stores and is a valuable service to any retailer.